School has started and although I may not have kids or be in school myself anymore, memories of the school cafeteria and strawberry milk came rushing back to me. To be perfectly honest, I am pretty sure my hankerin’ is not from me reminiscing as much as it is thanks to the non-stop milk commercials on TV this time of year. Yesterday after some serious pool laps (that’s right, I swam laps instead of floating on a big pink noodle the whole time), I swung by the grocery store to pick up a few things. I happened to be grabbing a gallon of regular milk when I spotted a big pink jug of Strawberry Milk. I glanced at the nutrition and promptly put it right back. There may have been 4 lbs of butter sitting in my cart (heeyyy, I am writing a cookbook! It’s work related butter! ), but there was NO way I was going to drink half a glass of Strawberry Milk for over 300 calories and almost 50g of sugar. Dream on Strawberry Milk makers, I can make it myself for less calories, sugar and money! In a small sauce pan over medium high heat, bring strawberries, sugar and water to a boil. Boil for 10-12 minutes --until the mixture slightly reduces and the strawberries are starting to break down. Using a mesh strainer, strain the mixture into a bowl and allow to cool. Once cool stir strawberry syrup into cold milk --adding as little or as much as you like! If you have any leftover, syrup can be refrigerated in an airtight container for up to 3 days. And good for you for putting that milk back! Things that are half sugar kind of scare me. Unless it’s an actual dessert! Wow, I am so going to try this! I’ve never had strawberry milk before but my doctor recently advised me to make sure I’m getting enough calcium. Since I don’t drink milk normally, this might be ideal. It sounds so good! I just looked up the ingredients for store-bought strawberry milk: competing for first place were our good friends high fructose corn syrup, Lowfat milk, propylene glycol, FD&C Red #40, FD&C Blue #1, carrageenan, and guar gum. Yum. Yeah, I’m only making your version from now on–thanks so much for sharing this homemade gem! Oh this pretty much beats any strawberry milk pink powder I grew up with – by a mile! Delish! So my schools never had strawberry milk (I actually don’t think I’ve ever even tried strawberry milk before) but I am thrilled to make this. Plus, it’s so easy! And I’m totally not judging you about the 4 lb of butter in the shopping cart. I do the same, and I’m not even writing a cookbook! Lovely pictures! And it sounds great! I love your beautiful and healthier version of homemade strawberry milk. 🙂 So pretty. Strawberry milk use to be the only way I’d drink it as a kid! This sounds way better than the store bought stuff! Much healthier than all that strawberry milk I drank as a kid! I’m not a strawberry milk afficionado, so this may seem obvious to everyone else. Why do you have to strain the mixture? I was wondering about a possible puree after the mixture cools a bit instead to use as the syrup. Thanks for the beautiful (and yummy) idea! I can’t express how excited I am for your cook book. Can.Freaking.Not. BUT! I can make blog recipes like this doozie in the meantime. Hurray! I definitely reminisce over strawberry milk often but never let myself buy it because of the calorie content. Totally making this! Strawberry milks reminds me of being a kid too! My Mom never let us have flavored milk (chocolate or strawberry) but my Dad did. It was always a special treat! Delicious! Refreshing and perfect for summer! 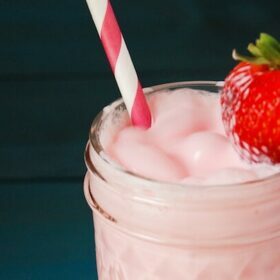 Since I’ve been known to sneak some of that really bad-for-you Strawberry Milk in the cold case, I could totally get into a healthier, homemade version! I bet this milk is WAAAYYYYYYYYYY better the the store bought junk!!!! Love how frothy and delicious this looks! 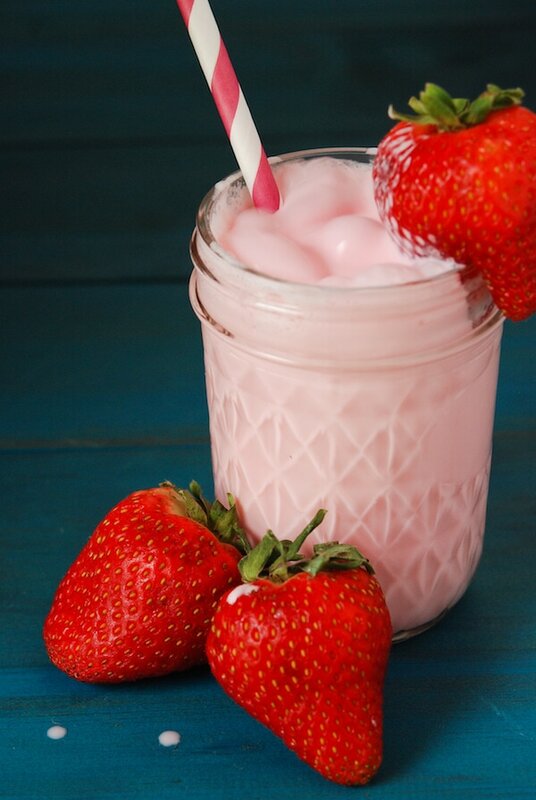 Love the idea of making your own strawberry milk! I am in love with this idea! I buy the powdered stuff to make strawberry milk, but this is so much better! My 6 yo daughter just asked me tonight at the grocery if I would buy her strawberry milk. I told her no, but may surprise her in the morning with this! Imagine a sweet suprised little girl. She will love it! Thx! Thanks! I have the syrup thickening on the stove top right now. This reminds me of what I’ve done to make raspberry coulis for my cheesecakes. Glad you shared it.